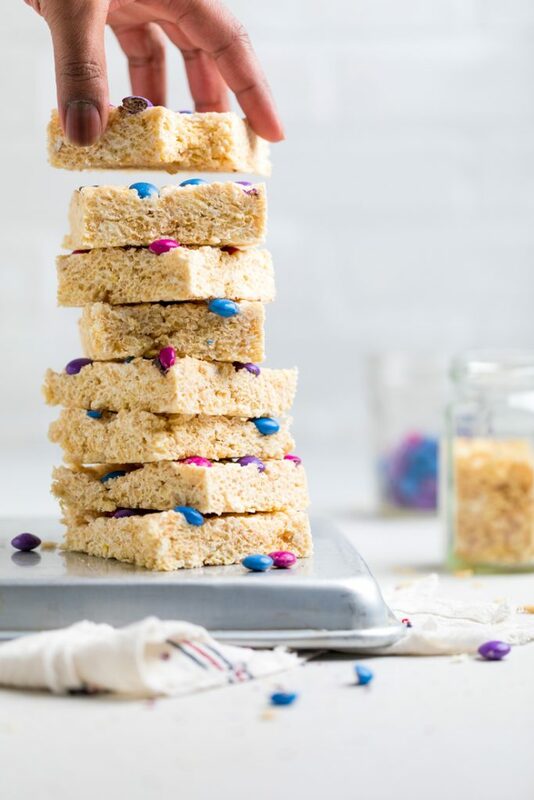 Vegan Rice Krispie Treats are a childhood classic reinvented. All you need is 4 ingredients and 20 minutes to have a delicious vegan dessert recipe. Almost everyone that you speak with, will be able to say that they made rice crispy treats at some point in their life. It’s a classic childhood staple. 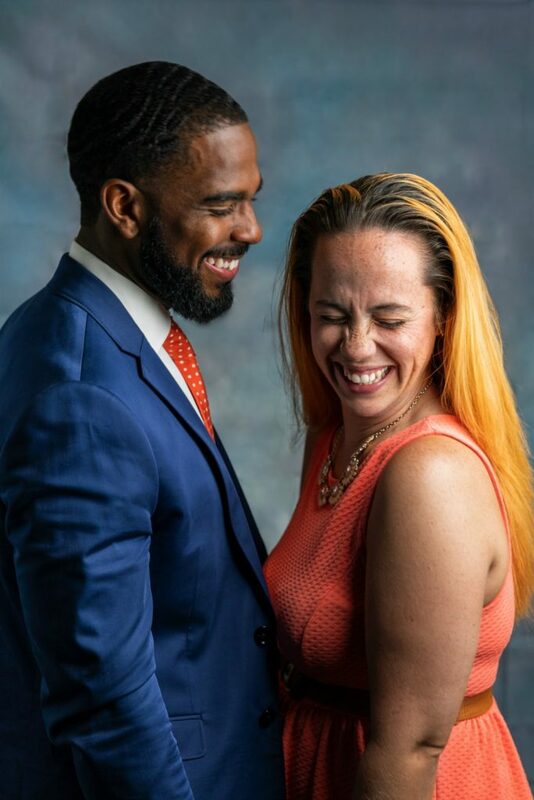 What is there to love? Crispy rice cereal, rich butter flavor, and tons of marshmallows. 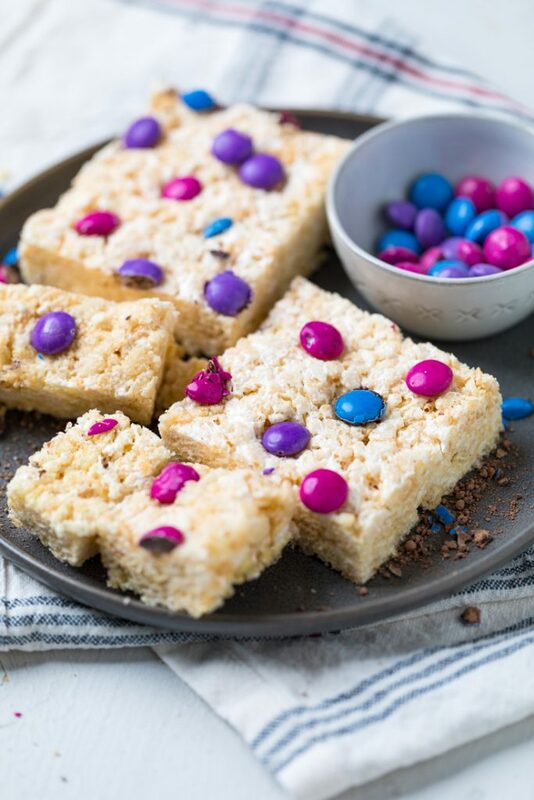 We’re talking that same love of the icon childhood dessert and making them Vegan Rice Krispie Treats today! It’s one of the first dessert recipes a lot of kids learn how to make because of how easy it is. There aren’t a lot of steps or ingredients, but it also means that it becomes a beloved treat no matter your age. 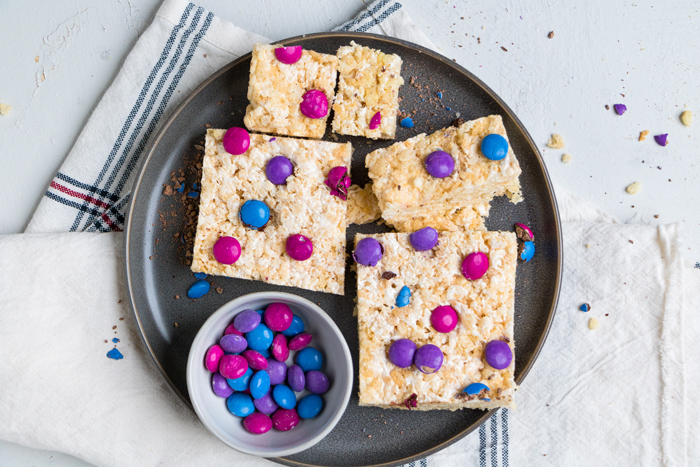 In fact, there’s just 3 ingredients needed to make the vegan rice crispy treats and then one extra one we’re adding in! 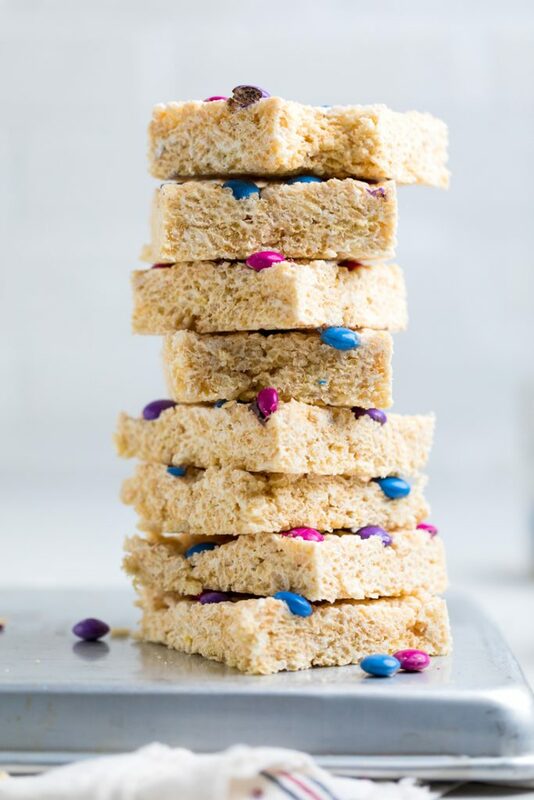 What ingredients do you need to make Vegan Rice Krispie Treats? 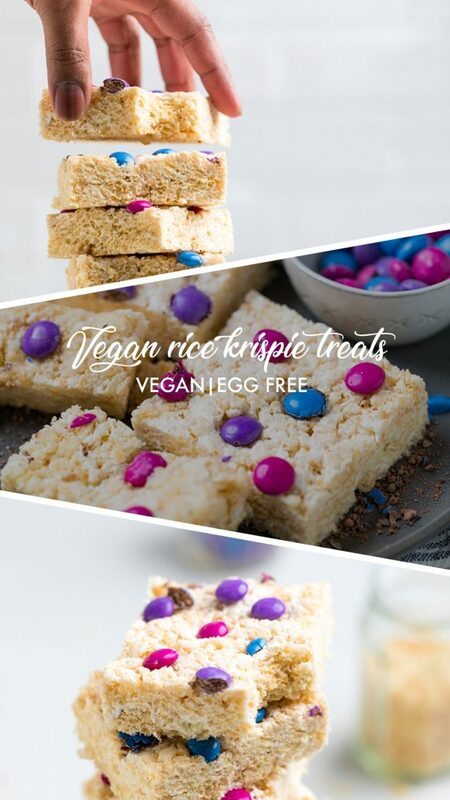 How do you make Vegan Rice Krispie Treats? The first step is to place a large pot on the stove over medium heat. Add in the butter and melt it. Once your butter is melted, add in marshmallows and stir until the marshmallows are melted. Remove from heat. Add in the crispy rice cereal and stir until very well combined. Then, pour out on a 8×12 baking sheet that have been coasted with oil or spray (we like to rub coconut oil). Using a spatula or your hands, press down on the mixture until even. Push down vegan chocolate candies if using. Lastly, wait until cooled, about 15 minutes, and then cut and serve. 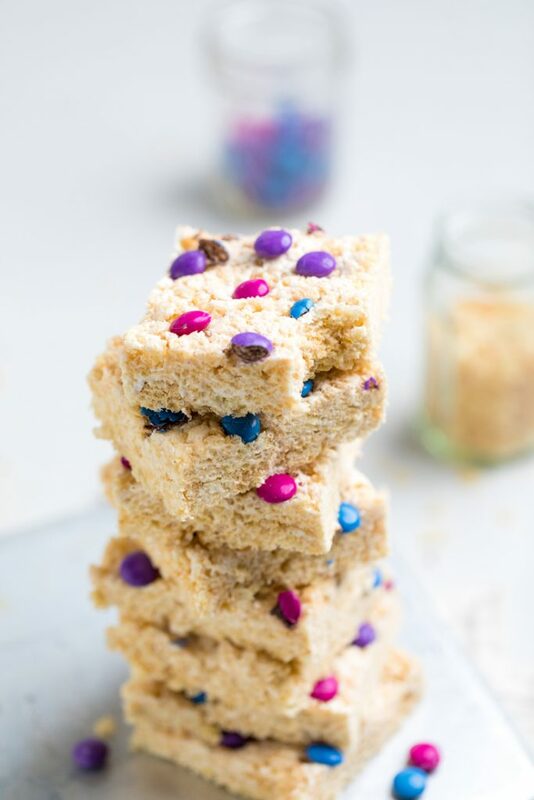 Can you make these Top 8 Allergen Friendly Rice Krispie Treats? 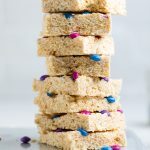 These vegan rice crispy treats are already Top 8 Allergen friendly using the ingredients that we outlined below. If you’d like more specifics, we use crispy rice cereal from our local Aldi grocer and then combine that with Earth’s Balance soy free dairy free butter and Dandie’s vegan marshmallows. Finally, we top with UnReal chocolate gems in dark chocolate. These particular chocolate gems are vegan; however, not all their chocolate gems are, so double check the ones you plan to buy. Where can I buy vegan marshmallows? Thankfully, vegan marshmallows are too terribly hard to find. We have seen them at Whole Foods, Wegman’s, Moms Organic, and our local health food store. I would recommend you checking there if it’s a spot that you regularly visit. However, you can also easily get vegan marshmallows on Amazon. They actually are usually cheaper on Amazon than some of the stores I’ve seen from $4-6. Grease an 8×12 baking sheet with dairy free butter or coconut oil. Set aside. Place a large pot on the stove over medium heat. Add in dairy free butter and melt it. Once butter is melted, add in marshmallows and stir until the marshmallows are melted. Add in the crispy rice cereal and stir until very well combined. Pour mixture out onto the greased baking sheet. Using a spatula or your hands, press down on the mixture until even. Push down vegan chocolate candies if using. Let cool for about 15 minutes. The, cut and serve.